I had an absolutely fantastic weekend. Seriously, loved it. We finished work early on Thursday afternoon. Worked from home especially. The Trucker did the grocery shop (far too much, as usual!) and we packed up the car and headed to Northam Farm. We arrived at about 4pm. Still plenty of light and no traffic to speak of getting there. 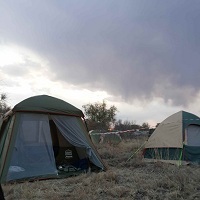 Our advance party (of two) had gone ahead on Wednesday and demarcated a camp site and we set up our tent. Very exciting. Although it wouldn't turn out to be completely perfect. We were warm and I absolutely love our bigger tent! But, the mattress was very disappointing ... the legs were ideal, we put a space blanket under the inflatable mattress and a blanket on top (all inside the mattress's casing), but unfortunately it just would not stay inflated. And, such is life, we could only use the car pump the first time, after that our tent, with our mattress, was just too far from the car. We hand-pumped plenty this weekend. Less than thrilled. But that was the only disappointment. We were warm and snug in there. We watched plenty of bands and it was pretty awesome :) We started on Thursday evening with Crash Car Burn (on the James Philips stage), which we left half way thru to try to catch a little Shotgun Tori all the way up the hill at the Ray-Ban Top Stage. But we completely missed her and ended up watching a little Shortstraw Unplugged instead. We only stayed for about 3 songs because the place was completely packed. But we did hear Keanu Reeves for the first time and it definitely became the can't-stop-singing-along song of the weekend for The Trucker & I! Brilliant. Also, wondered momentarily why Crash Car Burn sounded so familiar ... till I realised the lead singer was from Tweak and they played one of their old songs. Ah, I remember watching them at Party in the Car Park in August 2004. I won't lie, aside from our deflating mattress, sleeping wasn't easy at Oppi. People stay awake, talking, laughing, playing music from their cars. It all carries. The worst was Thursday night tho, when the 2 other campers in our group of 6 arrived just after midnight and then stayed up ... this attracts all sorts of drunk or high weirdos wandering the camps, I presume looking for their own campsite, or maybe just someone to talk to / yell at. But aside from that, we generally got a decent amount of sleep, but with many wake-ups during the night. 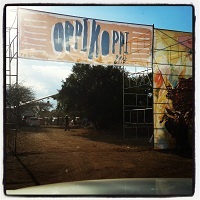 That and the distance to the loos was probably my least favourite thing about Oppi. I dunno why they couldn't have portaloos spread out around the whole campsite? On Friday we got up and had some coffee around the campsite before heading up to grab some food for breakfast. On the whole the food was just average, I thought. Some people absolutely raved about it, but I think it a) depends on what you're used to eating and b) how drunk you were. We tried a variety, it was all pretty tasty (except for one bland schwarma) but nothing stands out in my mind. Oh, except those waffles on a stick! But again, it's festival food, it needs to be produced en masse and quickly. I didn't try one of the Burger Express burgers (except their bacon, egg & cheese roll for breakfast) because the queues were just prohibitive. But apparently they were fab. We took our camping chairs with us on Friday when we went up and set up in the shade at Wesley's Dome to eat our breakfast rolls and catch Woodstock Mafia at midday. Jam's little brother plays in the band so I couldn't miss it. Really enjoyed it, I think I might have to buy their new album (Update: have just pre-ordered it here!). After that we headed back to camp and chilled out in the heat of the day. Sheesh, after some really nice overnight drizzle and a soggy Cape Town-type morning, Friday got quite warm. Thursday night also spoilt us (we soon found out) by being unusually warm (assume because of the cloud cover). 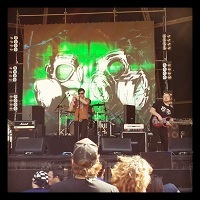 In the afternoon, we headed back up to the stages to watch Fuzigish on James Philips at 5pm. This was followed by a little Koos Kombuis Tribute on Wesley's, which we didn't stay for much of, and then Gangs of Ballet on James Philips. We headed back to camp after that, for some rest and warmth next to the fire but made it back for Shadowclub on Wesley's. 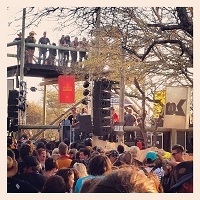 After that we went back and climbed onto bed, still clothed, waiting in anticipation for the possible Jack Parow. We had intended to watch him but then he got arrested the day before Oppi and was apparently cancelled. Rumor had it, by Saturday, that it had all been a publicity stunt and he'd still be playing in his 1am slot. But Shadowclub told us that although he wasn't playing, it was still worth coming to see, there was a surprise in store. Okay, so for us this completely back-fired. Although we set our alarm and woke up in time to head back, we were freezing and tired and not prepared to take the chance on if he was or wasn't playing. If only they'd just said yep, he'll still be there. We soon head from our bed that he was, but by then it was too late to get re-dressed and head up. We listened to Hosh Tokolosh from bed and went quickly to sleep. Saturday was the big day, but we didn't have anything on our to-watch schedule till 4pm. So we had a fabulous relaxed morning around camp. The Trucker & I actually managed to get a hot shower too, thanks to Samsung and my Galaxy S4 :) I wasn't very happy at the time of my shower ... they were pretty muddy, there was no shower curtain and so there wasn't much space available to keep things dry. And The Trucker had hidden the shower gel, folded inside his towel at the bottom of the bag ... but by the time he had finished his shower, I was very happy to have had one. I had cooled down and was enjoying having clean finger nails again :) It's the little things. Haha. Speaking of Samsung ... and Android, unfortunately the Oppi Beer Drone was a dismal failure this year. It's the first time they've tried it, so I can only assume, because it is a very cool concept, they'll be working on it more before next year and it'll be better. But this year it was pretty much useless, as far as we were concerned. 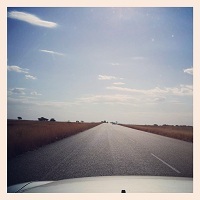 I had pretty much non-existent signal with Cell C (only managed better than Edge once!) so when I loaded it up, it just showed the map. There were no instructions on what to do, so we zoomed the map around to where our campsite was and filled in the form. We never saw the drone. Later The Trucker connected with his Vodacom signal and suddenly there was a little man on the map. But we couldn't move him and the 2 times we saw him, he was in different places and neither of them were near our campsite. So we gave up. 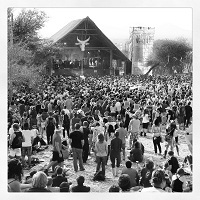 We did see the drone doing quite a few drops over the James Philips stage while watching shows, but mostly they seemed to drift too far from where they were dropped and ended up at the top of thorn trees (which people still climbed into to get to them) or on the roof of the stage (once). I think they need to be lower down before they let them go, but that is just me ... I did still think it was a super cool idea. On Saturday we started with Jeremy Loops, which was pretty cool. Must try to see him again in a smaller venue, I reckon. But we left a little early to try and catch some more Shortstraw on the Skellum stage. We caught the last few songs and were more than thrilled when they did a quick encore of Keanu Reeves :D Concert. Made. We watched a little of Toya Delazy before we headed back to camp. Her voice is amazing although I don't really like the style. Her back-up singers were absolutely hysterical tho. Later we came back for Mango Groove, which were the most phenomenal thing we saw the whole weekend. I think it was because a) they were early enough that it wasn't yet freezing and we weren't yawning our heads off and b) I knew the words to almost every single song. It was incredible. Special Star gave me goosebumps. 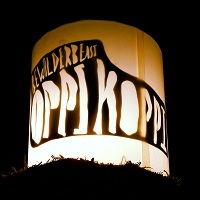 But it did make me realise I seriously missed out on going to Oppi back when I knew South African artists better ... the days of Wonderboom, Tweak, Jo Day, Qkumba Zoo etc. While I have, without doubt, enjoyed hearing new bands, quite a few who's CDs I'll now be getting, it must be an infinitely better experience knowing the band's songs. Then it was dinner time while we waited for The Narrow. I only really know one of their songs, Lonely Lonely, and when they played that it was fantastic! Then we watched Yellowcard and then it was time for Deftones. I wasn't remotely excited about this, I don't know them at all, but The Trucker was super keen. I think he loved it, I mostly froze while trying to stay standing (my feet were absolutely killing me by this stage!). 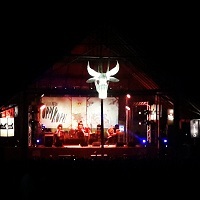 We didn't stay for their whole set and headed back to camp at about 00h15, set our alarm for 5am, pumped up our mattress and fell straight to sleep. Yip, we managed to be up at 5am, took the tent down and got on the road early early! We were home before 8am, and that included a quick take-out breakfast stop at the Wimpy in Harties. We had a quick shower / bath and then hopped back into (a real) bed and slept till almost midday. Yes, I'd love to go back next year ... it's their 20th!